The River Valley 100 is only 41 days away and online registration is now live. Please let us know you plan to attend by registering. 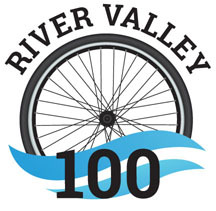 The RIVER VALLEY 100 bike ride will be on August 26th! Route details and times will be posted in the coming weeks. Here is a link to the cue sheet for the gravel route for anyone who doesn’t have or doesn’t trust or just doesn’t like to use a gps device. for those using gps the gravel route is available under the “route maps” tab above. The appropriate file can be downloaded by following the link to the route created on strava. Hey the tickets are up. Click on the link to register. Check out the 2017 gravel route.